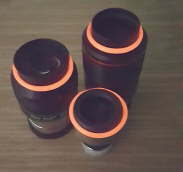 These rings are designed to custom fit primarily eyepiece accessories, tripod legs, .965" EP, etc. up to 65mm in diameter. they are water and UV proof. They have elasticity to fit tightly around each eyepiece or other. Perfect for dark location viewing for general public and individuals that are not familiar with "where do I look". They are charged from sun or artificial white light but can be greatly enhanced with a UV pen. Free with the purchase of 3 or more rings. The price herein is for 1 ring for devices up to 2-1/2" / 65mm. They may be plugged in to another one for larger applications! The price herein is for 3 rings for devices up to 2-1/2" / 65mm. They may be plugged in to another one for larger applications! The price herein is for 5 rings for devices up to 2-1/2" / 65mm. They may be plugged in to another one for larger applications! The price herein is for 6 rings for devices up to 2-1/2" / 65mm. They may be plugged in to another one for larger applications! The price herein is for 8 rings for devices up to 2-1/2" / 65mm. They may be plugged in to another one for larger applications! The price herein is for 10 ringsfor devices up to 2-1/2" / 65mm. They may be plugged in to another one for larger applications! "WARNING: CHOKING HAZARD - Glow Rings contains elastic material. Not suitable for children under 3 years."